The page for Rock Bottom menu prices. Rock Bottom specializes in offering guests handcrafted beer and made-from-scratch dishes at over 30 locations across the US. Rock Bottom’s menu consists of traditional pub fares like burgers, sandwiches, and pizza. Guests can also enjoy other items such as appetizers, salads, steaks, and specialty created entrées. Each Rock Bottom location serves a variety of locally crafted beers made in small batches and served on tap. Below are the latest Rock Bottom menu prices. Go there often? Join the Rock Rewards loyalty program where you will be treated like a ROCK star. Regulars earn points for ever dollar spent at Rock Bottom. Every hundred points earned qualified for a $10 credit on the next visit. Want to share your excitement for Rock Bottom? Purchase gift cards to give to family and friends. This restaurant has received good reviews for their beer and dishes like the avocado chicken sandwich with hickory bacon and the Smashed and Stacked Burger. These items are good with a huge serving of fries and onion rings. Other diners like the rib eye steak with bourbon glaze, gorgonzola cheese, and crispy onion straws. Rock Bottom’s beers go well with hand twisted pretzels with jalapeño spinach cheese dip. They also serve cocktails and the Brewery Platter appetizer, which is a tray of crispy nacho chips with loads of creamy dip. 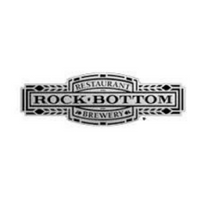 Rock Bottom’s beer is so excellent that they have received numerous awards over the years. Their La Jolla and San Diego Locations each won a medal at the Great American Beer Festival in 2009. In 2012, Rock Bottom won the Brew Pub Group Brewer of the Year” award. Many beer enthusiasts go to this brewery for the beer and comfortable laid-back atmosphere. For more information about Rock Bottom, please visit their website. Does ROck Bottom accept reservations? Yes, Rock Bottom does accept reservations via phone or on their website through a third-party app.